Tomato soup. It’s one of those things that I always brush off as being really boring, but I change my mind the second the rich and creamy soup passes my lips. 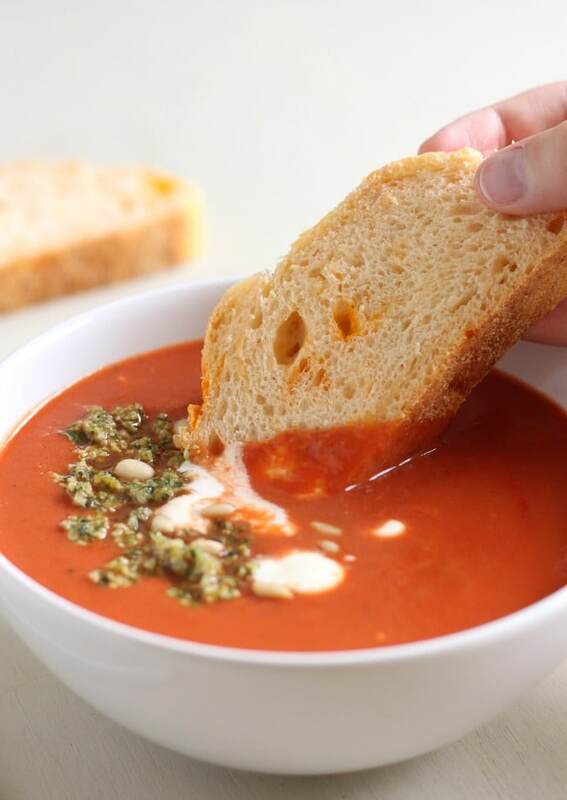 Tomato soup may not ever change the world, but it’s a reliable crowd-pleaser – that friend who’s always there for you, but sometimes gets taken for granted. Today I’m paying homage to our humble friend (I decided to carry on with the poetry thing…). 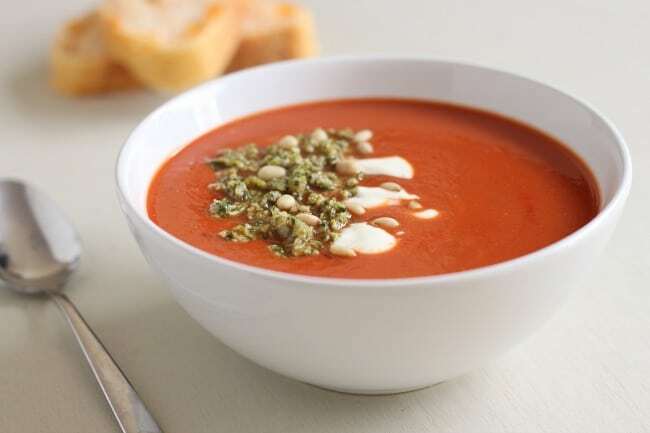 Shop-bought soups are fine, but this quick tomato soup recipe takes just 15 minutes (max!) to throw together, and you’re in control of exactly what you add. I kept it nice and simple – onion, garlic, passata, and a dollop of sour cream (or Greek yogurt if you prefer) to add that all-important richness. Fifteen minutes from start to finish. 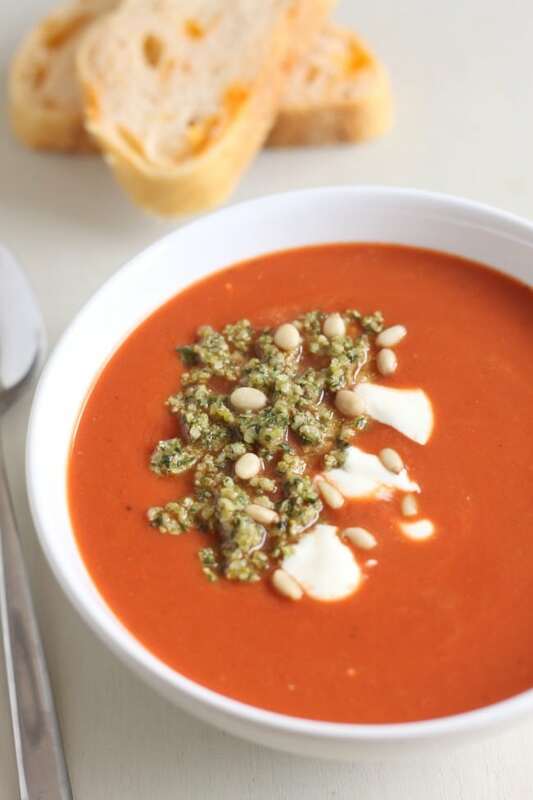 Since the soup is so excruciatingly simple, I added a little flair with a basil pine nut crumb (which is really just a fancy way of saying that I whizzed up fresh basil and pine nuts in a food processor). You can blitz it up while your soup is bubbling, so it doesn’t add any time to the recipe, but it just makes it feel a little bit more special. 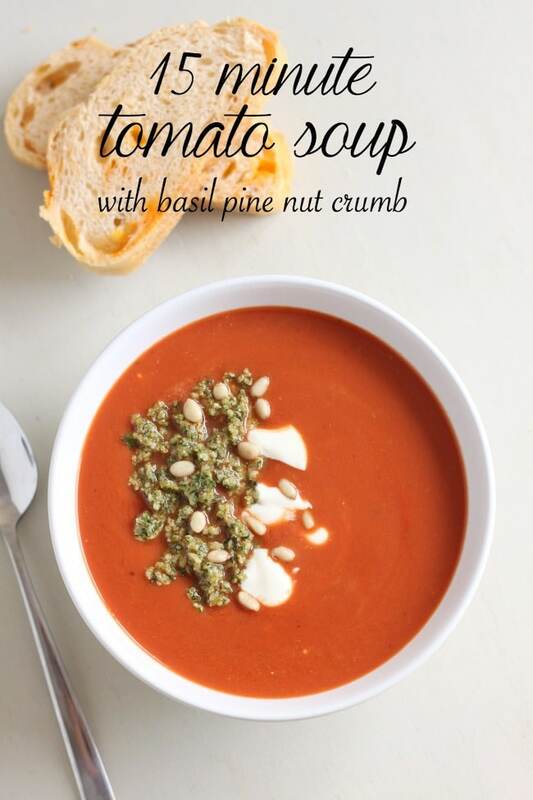 We all know that tomatoes and basil are a match made in heaven, and the pine nuts add a lovely Italian-style crunch. You can also dollop it with a bit more sour cream and a few whole pine nuts if you want to make it pretty! 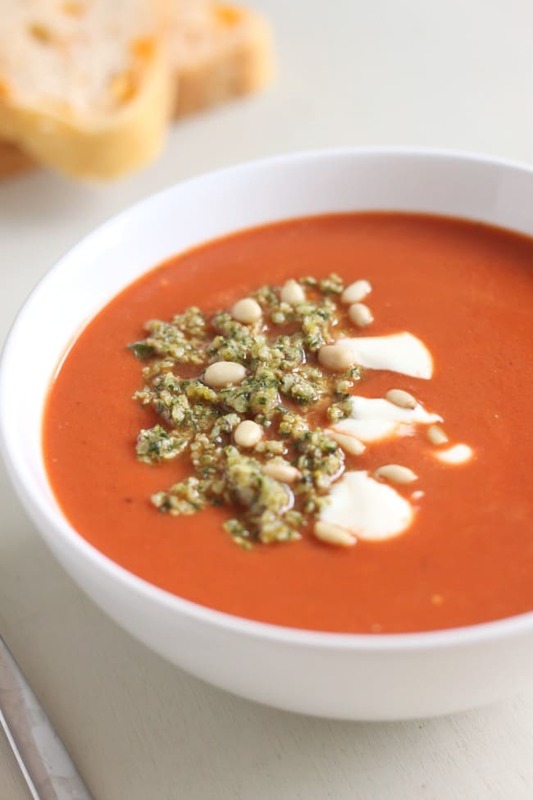 This quick tomato soup (and every other soup too, really) is a great dish to make in advance, because it can be reheated really easily. Just add your toppings right before serving, otherwise I can’t promise that the basil and pine nut mixture won’t have slowly sunk into the soup never to be seen again. Heat the oil in a saucepan, and add the garlic and onion. Cook over a medium heat for 5 minutes, stirring regularly, until soft. Add the passata, vegetable stock and thyme, and mix well. Bring to a gentle simmer, and cook for another 5 minutes. While the soup is bubbling, add the pine nuts and fresh basil to a mini food processor, and blitz for a few seconds until a coarse crumb is formed. Set aside. If desired, blitz the soup with an immersion blender until smooth. Season the soup with plenty of black pepper (you might not need salt unless you used low-sodium stock). Remove from the heat, and add the sour cream (or Greek yogurt). Mix well, and serve warm, topped with the basil and pine nut crumb. Love creamy soups? 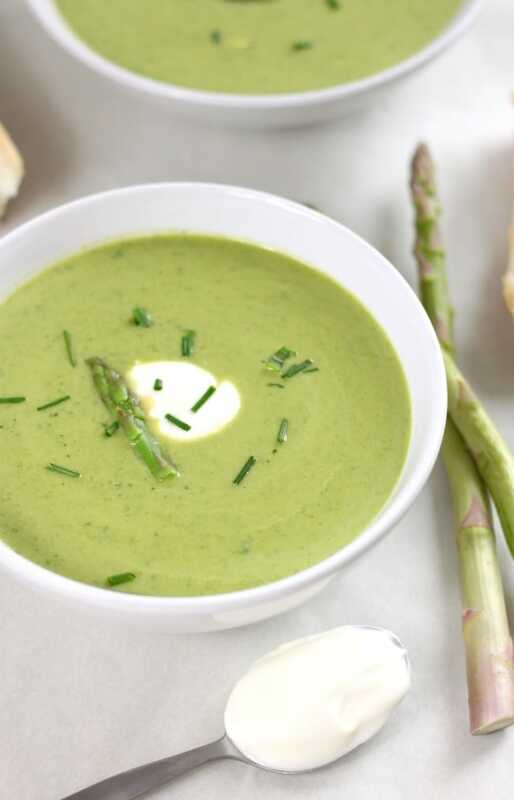 Try my creamy spring vegetable soup – packed with vegetables and Greek yogurt! This is definitely a recipe to keep for cold nights where you need soup, but can’t be bothered spending heaps of time cooking. In usual Suz fashion I added a couple of extra herbs for flavouring + a splash of white wine to the original recipe. This is perfect! I was totally craving tomato soup the other day but none of the ‘quick’ recipes I could find online were actually quick. Passata is a great idea! Will pin this for future reference, and oh, that basil pine nut crumb? Amazing! Love that basil and pinenut crumb, really adds bling! Passata is a great call for a quick and lively soup. What kind do you recommend? I like Cirio. Lol about the toppings. Well done for keeping yours afloat for the shots – serious skill! Tis the season — fa la la la la. The season for soup and I love it!! We make a different soup a week. There are so many tastes and variations of soups. This one is a keeper!! I too had to look up what passata is! 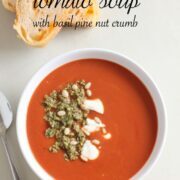 This looks yummy – tomato soup is one of my favorites for chilly afternoons and evenings, but it never even occurred to me to try making my own. Looking forward to trying it! I had to google what ‘passata’ was! Thank you for teaching me a new word! This soup looks easy, healthy and delicious. Haha it’s just sieved tomatoes! I think it might be similar to what’s called ‘tomato sauce’ in America?